That was the welcome and introduction that we received at El Capote’s 5th wine and food matching held Thursday 7th June. The theme for this evening’s dining experience was Italian. As pretty much everyone had already been to at least one of the previous four evenings, they knew the ritual that we were about to partake in. And a most enjoyable ritual it was! From the familiar board advertising the wines and food we were to enjoy to the charismatic interaction from Ian Gareze (and ourselves) about the sumptuous offerings we were about to be treated to. To get our Mediterranean pallets going we were welcomed to an aperitif of sweet mosto (Manilva). We all know this was not Italian but it most certainly got everyone in the mood for a great night of delicious food and wine, and we were proved right, once again. The Prosecco, light, floral and fruity was very well suited to the gambones. Admittedly I could drink sparkling wine as if it were water! However, they were very well matched. 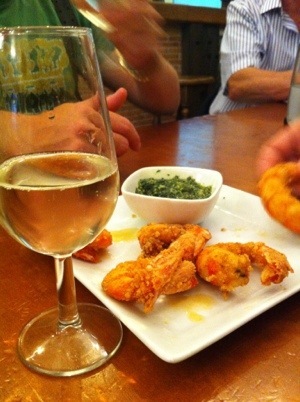 The Prosecco’s citrus notes cutting through the fried gambones almost cleansing the pallet with each sip (glug!). The homemade pesto was delicate but heady with basil; bringing out the Prosecco’s floral notes. I would have perhaps added more olive oil to slacken this and it would have gone a lot further, leaving it on the table to accompany several of the other dishes. The gambones (King Prawns) were beautifully cooked. Crispy on the outside but ever so delicate in the centre. Every mouthful a feast! The only downside of this was that there were only two gambones per person. My voracious appetite desperately wanted more but the next course was nothing to be sneered at. Simple; the natural culinary beauty and taste of this dish’s only ingredient was sublime. Fresh, succulent and beautiful; to top it off caught be a local fisherman! What an exultation of a dish – calamares a la plancha (grilled squid). From cooking to tasting this dish was delicious. The smell of grilled squid permeating every corner of El Capote; arousing the senses as we chatted and even attracting passers-by to venture inside to marvel at the delicious spectacle. When it finally arrived to the table, with everyone in the room salivating like Pavlovian dogs, it was heralded by a metaphorical sounding of trumpets. A good unobtrusive red wine to be complimented with fish. There is much wine snobbery that fish should only be matched with white wine. Whilst the command is ridiculous, the sentiment is not. Reds tend to be slightly more full bodied and overpowering than white hence its partnership with fish needs to be carefully monitored. The food served to complement this red was rolled sardine fillets with a pine nut stuffing. Never having heard of this before I discussed its origin with Ian (who having done his homework) explained that it was a Sicilian dish and were meant to represent birds. Were they served with mouths pointing upwards and gaping at the diner? No. My research explained that warblers (beccafacio) were hunted in ancient time from Sicilian nobles and cooked with their own entrails. Common people began to copy this luxury dish adapting it with sardines and swapped the entrails with the filling that is currently used. I thoroughly enjoyed this but would have preferred this served with the pesto as it would have matched the sardines’ pine nut filling, with its lemon backnotes cutting through the richness of the sardines. Many of the other diners were raving about the Caponata. I have to say, whenever I make Caponata, I take the easy way out and plonk all the veg into a saucepan and let it reduce gently until I’m happy that it’s the consistency that I like. Ian, I could tell, followed the stages properly. 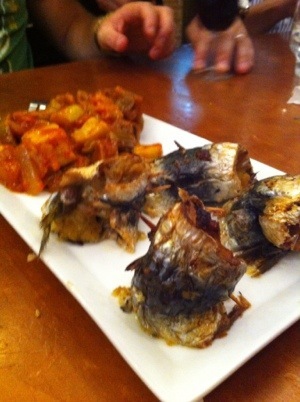 The aubergine was fried before being added to the onion and tomato mixture. There were also acidic tones to this so I imagine that vinegar must have been used to help this dish develop the depth of flavour that is required of its simplicity. However, what we were all in agreement with was that the Caponata was a dish in itself. It just needed some bread sticks or Italian crostinis. What wasn’t to like in this pairing?! Meatballs in tomato sauce with penne pasta and finished in the oven with a soft, fruity red to go with. Sadly we were all so full by this stage many of us could not eat another bite. Everyone would have been happy to have finished on the previous course and go straight to the last pairing. The noise levels in the room dropped a bit whilst everyone considered how full they were and realistically how much more they were going to be able to eat. Nonetheless people did manage to eat and drink their way through this course. Myself included! I dare say that as a result of us taking a bit too long on the previous courses this overcooked in the oven. I say this as I found the meatballs on the dry side of cooked. Oh and some grated parmesan at the table would have earned some brownie points, but considering the veritable banquet we had just gorged ourselves with this was an error we were all more that willing to forgive. As I watched Ian bring this joint of meat out and carve it infront of us I was once again taken over by greed. I immediately forgot how full-up I was. I also pushed to the back of my mind how Spanish this part of the menu sounded! The pork was succulent and flavoursome. Rubbed and sealed with herbs and seasoned well. I could imagine this dish served as a main course at a wedding. The Chianti; rich, fruity with vanilla on the nose was a beautiful wine to drink in support of this dish. My first comment to Ian as this came to the table was that these were not biscotti! In fact they were clearly amaretti biscuits as the smell of amaretto filled the air and was present in every bite of these delicious biscuits. Traditionally, biscotti are oblong shaped almond studded biscuits and dry from being baked twice in the oven. Limoncello is served with the biscotti as they absorb the alcohol without it changing the flavour of the biscotti. Indeed it was a shame that they were amaretti biscuits as I do have a fondness for biscotti, and ending the evening dunking my biscotti into a glass of chilled limoncello would truly have been Italian bliss. Not that I didn’t drop several of these into my glass and sip the limoncello whilst having them bobbing around my upper lip! Delicious!! As always, it was a thoroughly enjoyable evening at El Capote. Ian once again outdid himself with the food he cooked for us and the whole evening was great fun but I have to be honest; there was too much food. I can’t believe I’ve just said that. The polpete al forno was one dish too many. In reality the Sarde a Beccafacio should have been served independently from the Caponata as these were two dishes which were tasty, delicious and could have stood proudly by themselves. Not very often but sometimes, less really is more. Well done to Ian Gareze and everyone at the Capote who made the evening possible. I honestly can’t wait for the next one.